Make a Difference by Leaving a Lasting Legacy! The SCWTCA Endowment is committed to supporting health-related research for the Soft Coated Wheaten Terrier. Planned gifts are charitable contributions achieving both your philanthropic and personal/family tax-planning and financial objectives. The legacy you leave with the Endowment is one that will last a lifetime. Every gift you give, no matter the size, can make an impact on the future health of Wheaten Terriers. We invite you to include the Endowment in your philanthropic planning by becoming a member of the Endowment's Heritage Society. 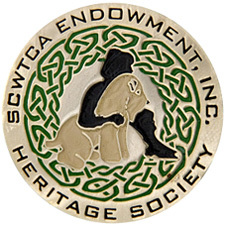 When you notify us of your intention to make a planned gift, you will be honored as a member of the SCWT Heritage Society. Additionally, as a society member, you'll receive invitations to annual recognition events, and special events, as well as recognition in SCWTCA, Inc., publications. Leave specific assets or a portion of your estate. Donate cash, publicly traded securities, bonds, etc. To make a cash gift today, go to Make A Gift Now. Designate the Endowment as beneficiary. Set up a charitable remainder unitrust or a charitable remainder annuity trust. Set up a charitable lead trust. Many of these options offer significant tax advantages. Be sure to seek the advice of your financial planner, lawyer, or advisor to decide which choice offers the greatest benefit and obtain details on these plans.